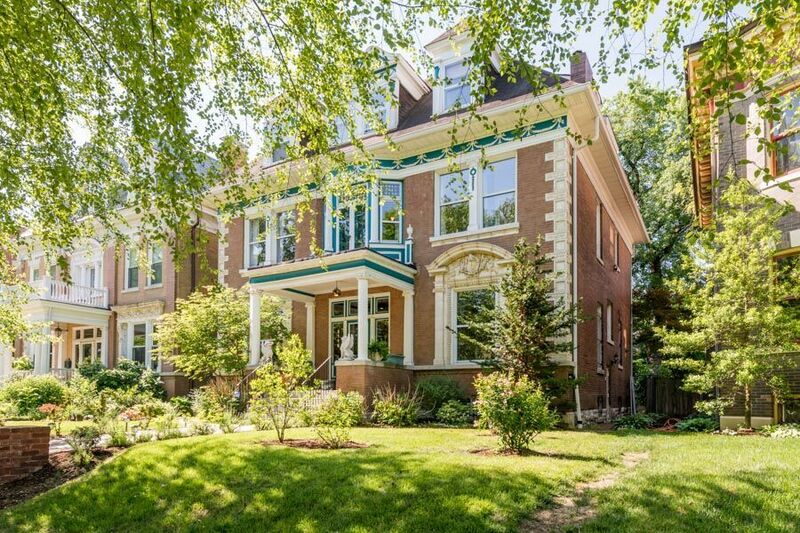 Built in 1902 is this exceptional home that has some of the best architectural features that you will see in the CWE. As you enter the foyer you will see the richly carved decorative columns and staircase moldings highlighted by a landing-sized stained-glass window. The main level features a parlor with decorative fireplace, family room with an ornate ceiling, a dining room with Rococo decorative moldings & a full bath. The kitchen has been updated with custom cabinets, granite counters, laundry alcove and gas stove. The kitchen leads to a large deck overlooking the backyard, which is well planted with mature trees and shrubs. The second floor features 3 bedrooms, a full bath in granite, and an office with a balcony. 5 decorative fireplaces throughout the home. Finished 3rd floor with private side entrance, 2 bedrooms, living area, full bath & kitchen. Walk to Forest Park, BJH, Metrolink and all that the Central West End has to offer! Gorgeous deep lot with deck. 4,929 sq. feet of living space. Living Area: 4,929 Sq. Ft. Custom Creve Coeur Home. Before & After.